Before you get excited, or furious, you need to keep one thing in mind. This image was originally sourced from 4chan, and that means that it could very well be fake. 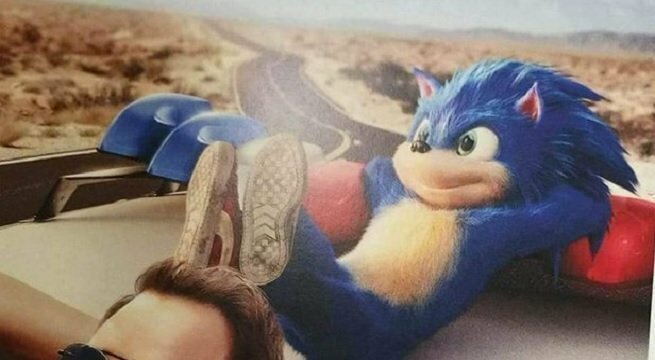 We are neck-deep in rumors territory at this point, and since everyone is talking about the Sonic the Hedgehog movie, there’s a great chance that a talented artist put this together for the sake of trolling the internet. We’ve had several rumors from 4chan confirmed this year, but far more turned out to be absolute nonsense. On one hand, Sonic’s design in the poster above doesn’t seem to match the outline we saw in the official movie teaser (more on that here). The outline we saw in the teaser seemed more athletic and toned than the Sonic we see above. Some people have suggested that this poster is indeed real, but old. Perhaps Paramount mocked up this poster a long time ago, and Sonic has been revised a time or since then? That is one possibility. Still, if this is genuine, Sonic fans are going to have to put their expectations aside and ride this movie out. It’s not the Sonic we all grew up with, but who knows, once we see him on-screen we’ll change our minds. We need this movie to be great, because it’s safe to assume that Sega will be basing at least one video game off of the movie in the future. If this is the design we’re stuck with, we hope that it is at least entertaining. What do you think? Is this real or fake? If it’s real, are you a fan of Sonic’s design? Let us know on Facebook or Twitter, and we’ll pick up the conversation there!